Ever since we tasted this 6-month aged Manchego from the renowned Villajos family, our idea of outstanding cheese changed. How could Manchego be so nutty and bold? The answer is milk: the family churns fresh sheep’s milk in tiny batches to make a truly artisan cheese. This semi-aged Manchego is so much richer than factory-made versions, your first bite will not be your last! The Villajos family has perfected the art of making Manchego cheese. Local Manchega sheep graze in pastures full of flowers and herbs that give their milk its full flavor. Once the ewes are milked each morning, the milk is quickly delivered to the Villajos. Under the steady hand of master cheese maker, Beni, the ivory-colored milk is heated and churned, then pressed into baskets. Here, the cheese forms its familiar wheel that will be aged for 6 months before it is ready. The result of longer aging is a firmer, sharper version of Manchego, with slight similarities to Parmigiano or even top quality cheddar. As cheese ages, it loses moisture: to prevent it from drying out, Villajos makes this version in larger wheels. It’s well-suited to sweet accompaniments, like quince jam or wildflower honey. 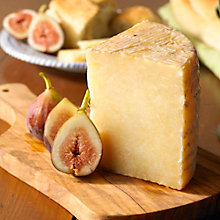 This older Manchego also completes a tapas spread nicely, alongside favorites like Jamón Iberico or Manzanilla olives. The Villajos have been recognized for their outstanding cheeses. This particular cheese earned a Gran Selección Silver Medal for Manchego in 2005, at the annual food and agriculture fair hosted by the regional Government of Castilla-La Mancha where it is made. With one taste, you’ll see why!